1)When your rising (Udit Lagan on eastern horizon) falls in Gemini rashi then You belongs to Gemini Ascendant. 1st house is Gemini rashi and lord is Mercury, so Lagan lord also Mercury. 2nd house is Cancer rashi and lord is Moon. 3rd House is Leo rashi and Lord is Sun. 4th house is Virgo rashi and Lord is Mercury. 5th house is Libra rashi and Lord is venus. 6th house is scorpion rashi and Lord is Mars. 7th house is Sagittarius rashi and Lord is Jupiter. 8th house is Capricorn rashi and Lord is Saturn. 9th House is Aquarius rashi and Lord is Saturn. 10th house is Pisces rashi and Lord is Jupiter. 11th house is Aries rashi and Lord is Mars. 12th House is Taurus rashi and Lord is Venus. Venus–Venus is only benefice Planet for Gemini. Venus is lord of 5th (Also Mooltrikona rashi libra falls in 5th house for Gemini) and 12th House. Venus is also natural Friend for Mercury(Lagan lord). Mars— Mars is worst malefic for Gemini Ascendant.Mars is lord of 11th house and 6th house also Mars is natural enemy of Mercury. 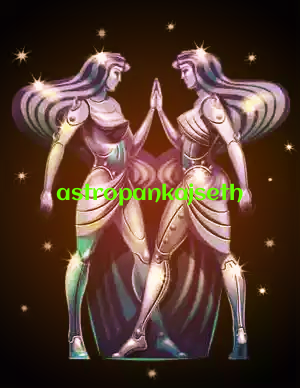 Jupiter—Jupiter is lord of two Kendra house(7th and 10th) so as per as Kendradipati Dosh Jupiter is malefic for Gemini. Also Mercury is enemy for Jupiter. But as Jupiter is neutral for Mercury so it is also bad for Gemini Ascendant. Sun—Sun is lord of 3rd house so it is Malefic for Gemini. Mercury—-Mercury is Lagan lord but also lord of 4th house(It is also Mooltrikona rashi of Mercury) so as per as Kendradipati Dosh mercury become malefic. So at same time it is benific and malefic so it is consider Neutral for Gemini. Saturn—Saturn is also lord of 8th house(malefic) and 9th house(Benefice) so it is also consider Neutral. Moon—-Moon is lord of 2nd house so it is treated as Neutral. Marak-–Moon and Jupiter is Marak for Gemini as per as rule. But Mars is giving very worst results regarding Marak point also some time Saturn in the same role. 4)Body constitution-–For Gemini Ascendant 1st house is Gemini rashi and lord is mercury so it is according to Gemini rashi. So they are Medium/average in height(Gemini represent medium height).Good developed face (Both 1st and 2nd house belongs to good look and beauty of face).Charming in face(Mercury is planet of charm and cancer(For face) is also charming rashi). They have also beautiful or appealing Eyes(Due to cancer as 2nd lord and also Taurus 12th lord ). Health—As Gemini is a Air sign . So there body is major element is Air(Vayu Pradhanta). Mercury is lagan lord but it is earthy planet.6th house is Scorpion Water rashi. So it is giving Sama (Mixed) Dosh to Gemini Ascendant. Specially Vata Dosh is major problem for Gemini.Asthma or such type problem is Generally found in Gemini Ascendant. Mentality belongs to 1st and 5th house both are Airy rashi. So airy quality is seen in Gemini People. Air is unstable,Easy to go any where,Movable type so Gemini native are Unstable minded,Fickle nature,easy to reach any person(Good in friendship).As Libra in 5th house also indicating Balance mentality and very practice mentality . For Gemini Ascendant all Kendra are dual rashi so this tends there dual approach in all there work(Mind,Relation,Work). So they are dual minded,Not concentrated in any work. For Gemini 2nd house is cancer and lagan lord is mercury so they have Sweetness in speech. Leo 3rd house “house of Communication ” makes them aggressive in communication. Virgo 4th house Give a intelligent mind. Libra 5th house make him Easily approaching. So Gemini are good in communication, Intelligent,Argumentative, and sweet in speaking. They have logical and philosopher approach. But this approach also make them Problem Maker(Also there dual approach have contribution of this). Air sign and mercury also make him good in learning. They are Generally like to clean and clear cloths means inclined to clearness or cleanness in any matter. As per as Gemini symbol they are attracted towards opposite gender. Air sign in 1st and 5th house also make him Volatile in nature And Working first in place of thinking.